Donald was born in Dulwich but spent much of his childhood in Germany. His father learnt German while a prisoner of war and after the war he used this skill working for the Foreign Office in Germany. As you can guess from his name, his family did not originate in the south. They came from the Isle of Lewis and Don was very proud of his Scottish roots, returning with his family for holidays. Don and his family settled in London on returning to England. Don met his partner, Marilyn, at the Shant in East Sutton, when she went there with her brother. Don was behind the bar! Don and Marilyn spent many happy years together, first in Harrietsham, then in a cottage in East Peckham, which needed much renovation, which they did themselves. They then moved to West Farleigh, 34 years ago. Again doing a lot of work on the house, themselves. Don and Marilyn enjoyed many holidays in the sun, exploring Spain, Italy, Mauritius and America. Don was originally an Electrical Engineer. 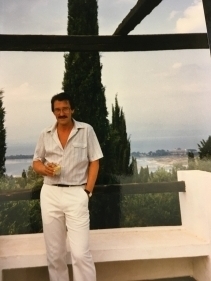 In later years he formed a company, SBD Fabrications Ltd, with three work colleagues manufacturing double glazed window units and conservatories. The business was based in Sittingbourne. He enjoyed playing squash and latterly golf and made many good friends this way. He was kind and caring and will be missed by his family.